If you don’t have a turkey on hand, use chicken wings or a ham bone, or ready-made chicken stock. Put turkey carcass or wings, sliced onion, celery, thyme, bay leaf, and peppercorns in a stockpot and add cold water to cover. Bring to a boil, skimming away and discarding any scum that floats to the top. Lower heat and simmer uncovered for 60 minutes. Pour stock through a fine strainer, discarding all the solids. Set aside 2 cups of this stock. Return the remaining stock (you will have about 10 cups) to a 4-quart saucepan and boil uncovered until the stock is reduced to 2 cups (about 45 minutes). Cook the beans in a one-and-a-half-gallon stockpot or as instructed on package (after prescribed soaking), using 2 cups of stock to replace 2 cups of the water. After 35 minutes, add the cubed winter vegetables and bring to a boil, then lower the heat and cover so the mix simmers. Add unreduced stock as necessary to maintain a rather thick texture of soup. Simmer for about 45 minutes. When the beans and vegetables are just barely tender, season the soup with chili powder, salt, and pepper, to taste, add cooked cubed turkey or chicken, and the optional cabbage, or romaine lettuce. Stir occasionally so bottom doesn’t burn. Continue to cook until the greens are tender and the flavors have melded (about 15 minutes longer). Refrigerate if not serving immediately. Fifteen minutes before serving, bring soup to a gentle boil. 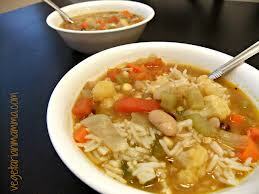 You may need to add additional stock or water to keep a semblance of soup texture. Stir to prevent burning. Add a handful of cooked fusilli or penne (if you wish) and simmer till soup is hot and pasta cooked. Taste again for seasoning, adding salt and pepper to taste. Serve each portion topped with freshly grated Parmesan and a drizzle of good olive oil. Serves 6 as a starter, 3 to 4 as a main course. Best of all if you are just two, add some broth and slices of cooked sausage to the pot the next day and present this to your loved ones as if it’s a brand new soup.